Dust your lashes with baby powder before using mascara, this will act like a primer and make your lashes look fuller without falsies. If you are out of dry shampoo sprinkle a small amount of baby powder on your roots, the powder will absorb the excess oil. For dark hair you can mix cocoa powder with it, for red hair mix a little cinnamon. 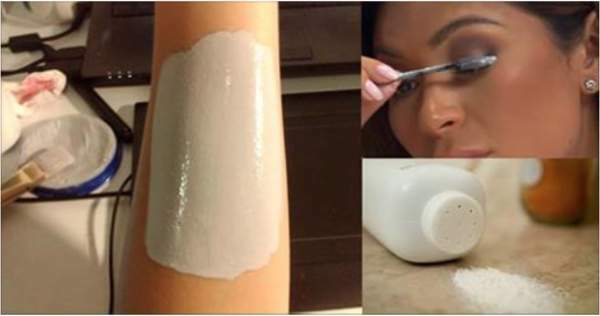 Evenly spread the powder through your hair using your fingers. When we go to the beach we often bring lots of sand along in our clothes and bags as a return gift. Simply sprinkle some baby powder on you and your kids’ sand-covered hands before you enter the house. The powder will absorb the moisture and make it easy to clean off the sand from hands. Sometimes the oils in food spoils your favorite clothing which is irritating. Just dab the oil-based stain with baby powder to absorb the grease before you wash as usual. Make your bed sheets feel cool in hot weather by using baby powder. It also helps cool your body from the day’s heat by absorbing excess perspiration, your sheets will feel soft and luxurious! 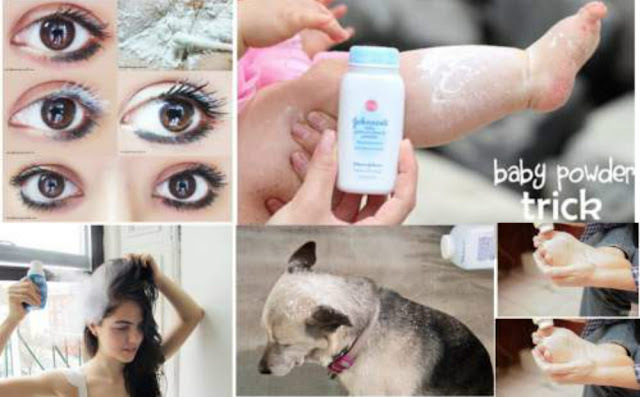 Baby powder works great on your pets too. Help your furry friend feel refreshed between baths by rubbing the powder on your pet’s fur. Leave on for 5 minutes then brush. It will help their fur look fresh and the fragrance will eliminate any smell. Sometimes we get smelly feet when we wear shoes without socks for long periods or work hard. Try rubbing some baby powder on your feet and sprinkle some in your shoes every morning. Powder will absorb the sweat and keep your shoes clean and feet fresh. Some of us wear gloves while we wash dishes or clean dirty areas to protect our hands, but hate the struggle from slipping them on and off. Next time you need them sprinkle some baby powder on your hands to prevent the gloves from sticking to your hands. Keep your cards from sticking together by using baby powder. Put your cards loose in a box of a powder and cover it, shake a few times then remove the cover. The cards will be smooth and easy to use. Use baby powder to dust your flower bulbs before planting. Place 4-5 bulbs and 3 Tablespoons baby powder in a sealed bag and give it several gentle shakes. The baby powder will reduce mold in the bulbs, lessening chance of rot. Use baby powder as aftershave, this is good for men and women. It’s a cheap way to keep your skin soft and supple after a shave. Stop wasting time on tangled jewelry! Sprinkle baby powder on necklace chains to loosen the knot, then use a pin to untangle.